Specializing in classic cars as well as special interest automobiles, Dennis Wilson, owner of Wilson Motor Company, has carried on the family business his father started back in 1934. Today, Wilson Motor Company carries an extensive inventory of many rare and unique cars. Looking for one you don’t see on the web site? 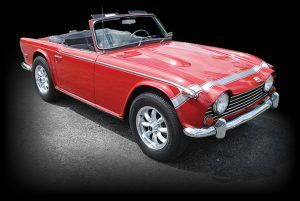 Wilson Motor Company may have the classic car you seek. It’s possible that the car you’re looking for is in stock but simply hasn’t been posted to the web site. To be certain, contact Wilson Motor Company at 636-239-6781 or email us. We have many Triumph parts for sale. Email us or call with your request.